Where does time go?? Can anyone tell me please?? It's Wednesday already and I have to finish two pillows by the end of this week and start on a baby girl fabric book. 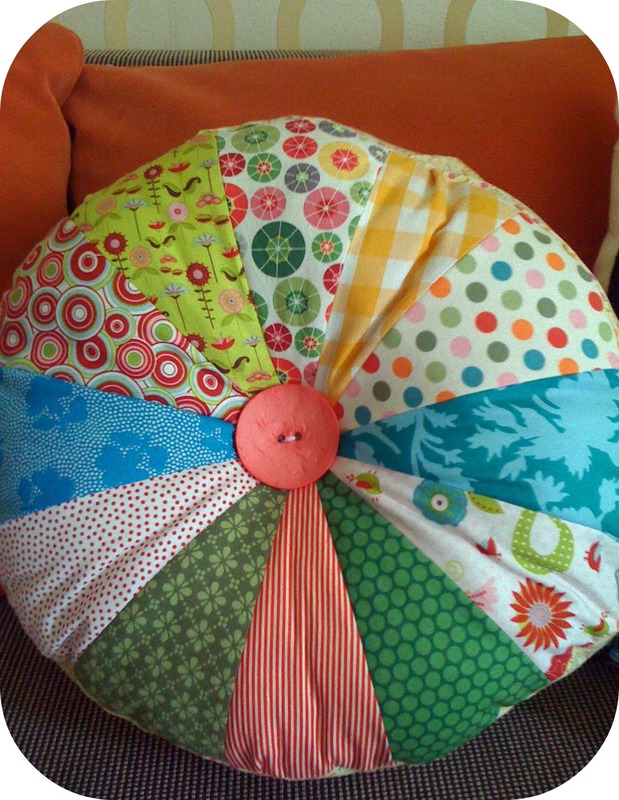 I'm currently working on a sprocket pillow for my lovely cousin, who said to me "Eleni, pls make me a pillow like this one, I've fallen in love" !!! aaahhh!!! Music to my ears:) She left the choice of colors/prints up to me, and if I remember correctly, her living-dining room is full of blue and mint and purple shades. She already has the tea time pillow set on her couch, so I was thinking the combination of colors I chose, would be perfect!!! I only have second thoughts on the deep purple wedge, I would love to have your opinion, do you think it matches, or should I replace it with a light background fabric? Now, I'm also working on the second pillow for my friend at work. 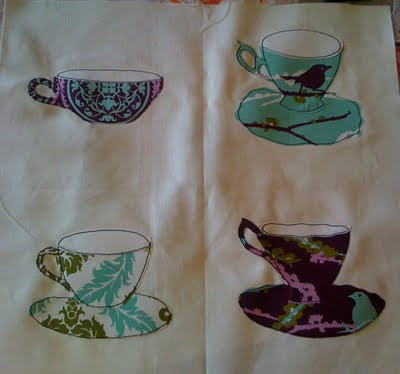 Till now I have appliqued all the tea cups, I have to add "tea time" in the front side and also cut the back side. I was thinking of going with a combination of two prints from Aviary 2, instead of plain white. Any thoughts?? I think both pillows, will look great finished. I just love this fabric line. Don't you??? yasou Eleni, thanks for leaving your comment on my blog! 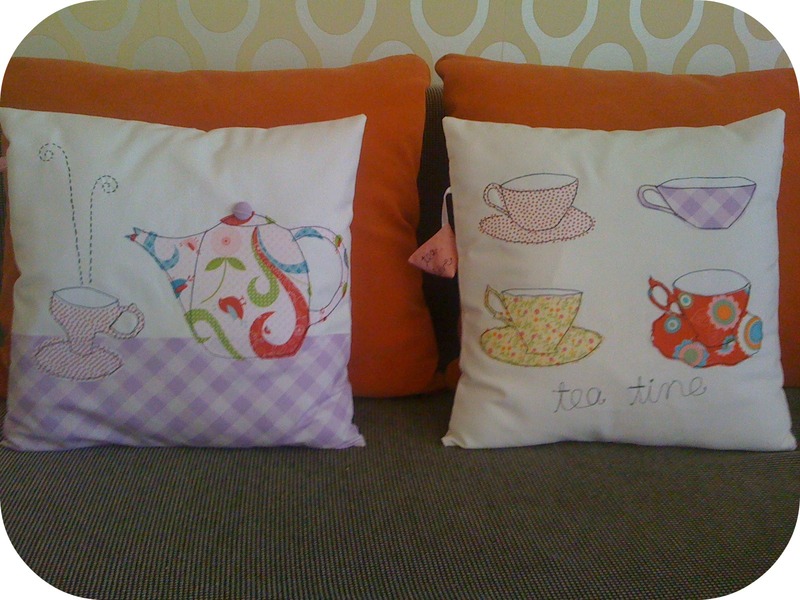 Love the look of your tea cups pillow, looking forward to seeing the end result! Κράτα το μωβ!! ταιριάζει με την κουζίνα μου! the pillows are both delightful. Nice Work. I love them!! 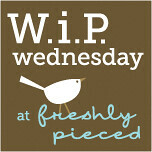 the aviary II is gorgeous.I am going to check on the rulers tomorrow, I hope they have them. 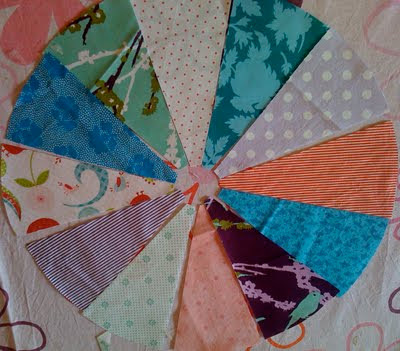 I think you should leave the purple in, I love how the fabrics look together. Your cousin is very lucky! Eleni, I absolutely love the look of those teacups! So beautifully done! hello! i'm your newest follower #150! whoo hooo, stopping by from FFF hop! come be my 151st follower LOL.. Following from Friend Finding Friday! Thanks for linking up at Bacon Time. I am following back with GFC. I love the tea cups. I sure hope to see you next week at our 2nd link up. I have lots of great give aways going on my give away page to if you like that sort of thing.